What is the procedure for obtaining a certified copy of the building plan? What is the procedure for enclosure of Balcony? What is the procedure for filing an appeal for reducing the rateable value of the property? Can a member covers the parking stilt? What should a Flat holder do if the shop keeper on the ground floor is causing nuisance? What should a Flat holder do if there is leakage from the upper flat? 1) Comptroller Auditor General of India- to investigate loss to BMC on account of non levy of property tax on slum dwellers dispite signing agreement in 2006 between BMC, State Government and Government of India. 2) Mission Director, Jawaharlal Nehru National Urban Renewal Mission- to discontinue grant to BMC for their failure to introduce mandatory property tax reforms as agreed in the aforesaid agreement signed in 2006. 3) Municipal Commissioner, BMC, Municipal Chief Auditior, Assessor and Collector and others for loss of revenue to BMC. 4) We have also filed RTI applications with aforesaid authorities seeking details of the action taken by them. It is relevant to state that the Municipal Corporations of Delhi,Chennai, Banglore, Kolkatta, etc. are charging property tax to the slums / jhuggis / zopadis then why BMC dispite signing agreement in 2006 is not collecting property tax. This amounts to deliberate and intentional ommission on the part of MC and others of BMC to recover the said property tax. As such we demand that thisloss occuring to BMC due to the neglect of MC and others should be recovered from their salaries. c) The builders owe Rs.628 Cr. out of which only Rs.8 Cr. has been paid. As such is the BMC going to recover Rs.620 Cr. with 24% interest from the builders (seeattached news report). PLEASE CIRCULATE THIS AMONGST YOUR FRIENDS AND RELATIVES AND TAXPAYERS TO CREATE MASS AWARENESS. According to legal and realty experts, while the laws are generally good, society MCs take advantage of sundry shortcomings to connive with builders at the time of executing redevelopment contracts. As a result, tens of redevelopment cases end up in courts. While cases between housing societies and their members land in cooperative courts, a feud among a society, its members and a third party goes to the high court. At the ward/department level, there are lakhs of cases of such disputes. The government’s taciturn approach does not help either – legal experts say the departments concerned turn a blind eye to the “dictatorial manner” in which MCs function by flouting laws and disregarding rules. Consumer Education & Research Society (CERS), a name synonymous with Consumer welfare, came to the rescue of complainant Kalpesh Parikh, who purchased an RO water purifier from Whirlpool India which was later on found to be defective within a few days of its purchase. Recently the matter was settled through Lok Adalat organized by Consumer Forum on 25/3/2013 and as per the settlement, Whirlpool India has agreed to pay a token amount of Rs.2000/- along with replacement of the damaged parts of the machine and extending the warranty cover for the damaged RO sold to Kalpesh Parikh. As per the case details, Kalpesh Parikh was facing major functionality problems with his recently purchased RO water purifier from Whirlpool India. However, his repeated attempts to get it repaired from Whirlpool went in vain as the company refused to pay heed to his complaints. As a result of the constant neglect of Whirlpool India, Kalpesh Parikh approached CERS to intervene and resolve the matter. After verifying the case details, CERS was quick to react to the situation and lodged a complaint against Whirlpool India in the consumer forum. As per the settlement arrived at Lok Adalat between both the parties it was agreed that a technician from Whirlpool will visit the complainant’s house and do the necessary repairs of the RO water purifier. Even if there are major repairs involved, it will be Whirlpool’s responsibility to have the machine repaired and returned to the complainant within 3 weeks from the date of initiating repairs. Additionally, it was also decided that Whirlpool will give Kalpesh Parikh an extended warranty cover for the RO water purifier that will be considered valid from the day it is returned to the complainant in workable condition. World Bank’s investment arm, the International Finance Corporation (IFC) is considering a women’s investment fund programme aimed at investing in women-owned businesses globally through private equity funds, reports Business Standard. Furthermore, IFC’s ‘Banking on Women’ programme supports access to finance and builds technical capacity for women through global and regional financial institutions. “Women entrepreneurs are changing the face of the global economy, helping to sustain job creation and economic growth. It is estimated that women-owned entities represent over 30 percent of registered businesses worldwide. Unfortunately, on average, only 5 to 10 percent of women-owned entities have access to commercial bank loans,” said IFC. 1. New System of Property Taxes will be applicable with effect from 01.04.2010. in the present system, the property tax is based on Rateable Value fixed at the time when the building receives its occupation certificate and the same does not changes till the building is redeveloped and/or is given on Rent. But however, the percent of Property Tax goes up and as a result the rate of Property Taxes varies from 58% to 315%. 2. There is different rates chargeable to Non-Agricultural Land, Building under construction and Building ready for occupation (such as Flats, Office, industrial Galas, Godowns, shops, etc.) depending on the market value of property as per Ready Reckoner of Stamp Duty published by the Government of Maharashtra. 3. Once the Property Tax is fixed for a property, the same would be applicable for the next 5 years from the date of application. 4. If the Property tax as per the new system is much higher than the Property tax as per the old system, then the Society or the owner would have the option to write to the Municipal Corporation. The same cannot be more than double in the case of the Residential Property and three times in the case of a commercial property. The increase in the Property Tax after 5 years from the date of application cannot be more than 40% for the next 5 yrs. The same would not be applicable in the case of New Building. 5. The same rate of property tax would be applicable whether the property is self-occupied or given to others on the basis of Tenancy, leave and license, lease, caretaker, Business centre, etc in the present system. The same is approved by the Assembly and will be incorporated in the New System. The Officers of BMC have so much of powers that in the case of a let-out property, the Property tax can vary from 35% to 60%. In Pune, Kolkatta, Delhi, the Property tax is double of the normal property tax if the property is given on Tenancy, leave and license, etc. 6. Concessional rates will be applicable to Charitable Organizations such as School, Hospitals, Temples, etc.). In the case Government Offices for Central as well as State, Foreign Embassies, etc no property tax. 7. the property tax will not be on concessional basis in the case of a new building. However, the old building would enjoy a rebate from 5% to 75% depending on the age of the Building. But the after rebate value cannot be less than the value of the land plus the construction cost. 8. The New system of property tax is transparent and even the property owner can calculate the property tax payable by referring to the Stamp Duty Ready Reckoner. Hence, there would be less corruption. 9. As per the New System, the rates of property tax would be reduced in the Suburbs and increased in South Mumbai depending on the age of the building, floor, type of construction, etc payable on the Market Value of the property calculated as per Stamp Duty Ready Reckoner. 10. If the area of the Residential property is less than 500 sq. ft. (carpet area) then there would be no increase in the Property tax payable. Hence, the New System of property tax would not affect 70% of the Mumbaikars for atleast 5 yrs from the date of application. 11. If the property is lying vacant (i.e. if it is not in use) then the property owner can apply to the BMC and the property tax will be 40% for the normal property tax payable. 12. Further, the Property tax would be payable on the Built-up area of the property. 13. There are chances of error in Data collected by MCGM about the age of building, user type(residential, shop, office, etc. ), carpet and built-up area of the premises, etc. in this event, society or property owner can file the complaint /objection with MCGM in prescribed format. 14. The complaint has to be filled with respective Municipal Ward office, with the assessment department. The complaint has to be filed within 21 Days of receipt of the property tax Bill. If you file complaint after 21 days, please file the same with request for condonation of delay. 15. 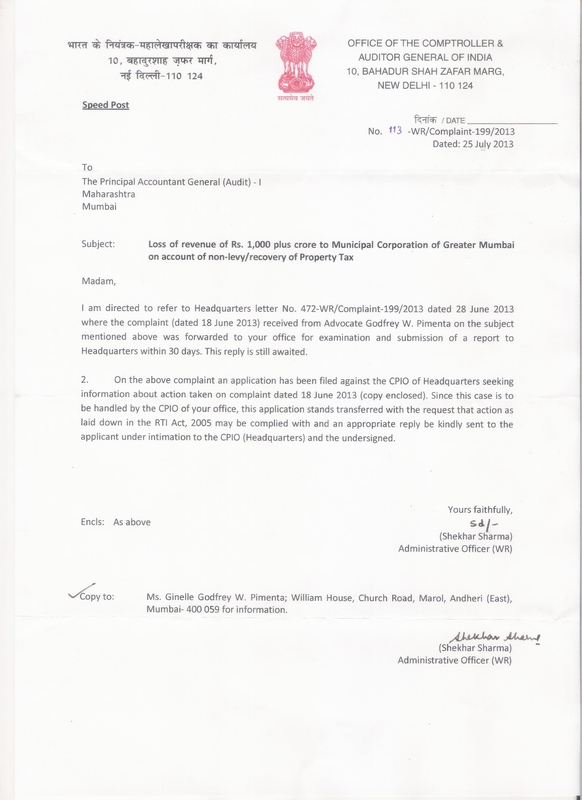 Format for complaint is already sent by MCGM along with the new property tax Bills. Pro-forma is attached herewith.